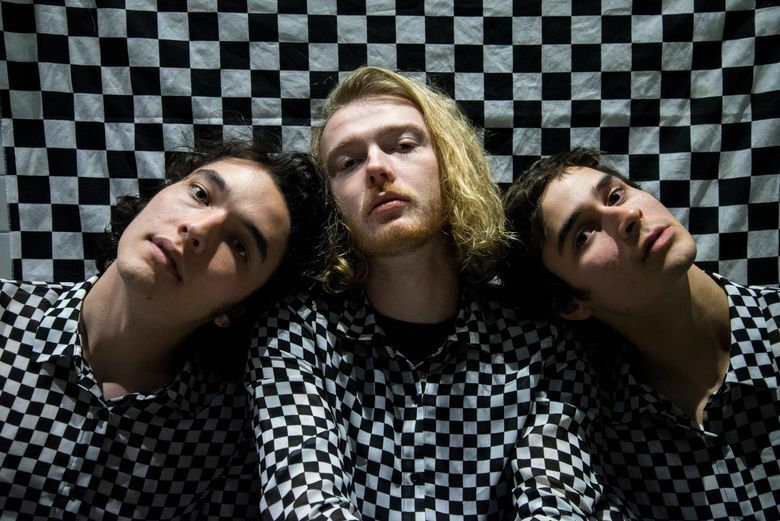 After turning heads with a busy South by Southwest schedule, Seattle garage-rock faves Naked Giants are set to tour with Car Seat Headrest. Around the time Gianni Aiello flips his bass behind his head, fluidly pounding the bass line beneath Grant Mullen’s unruly guitar work, we know we’re in for a ride. Minutes later the wiry co-frontman is soloing like an acid-dropped Ted Nugent (minus the bad crazy) on a “Nuggets” binge, his wavy mane flipping all over the place. Behind them, hard-hitting drummer Henry LaVallee plays engine and conductor, setting the throttling pace while keeping everything from flying off the rails. 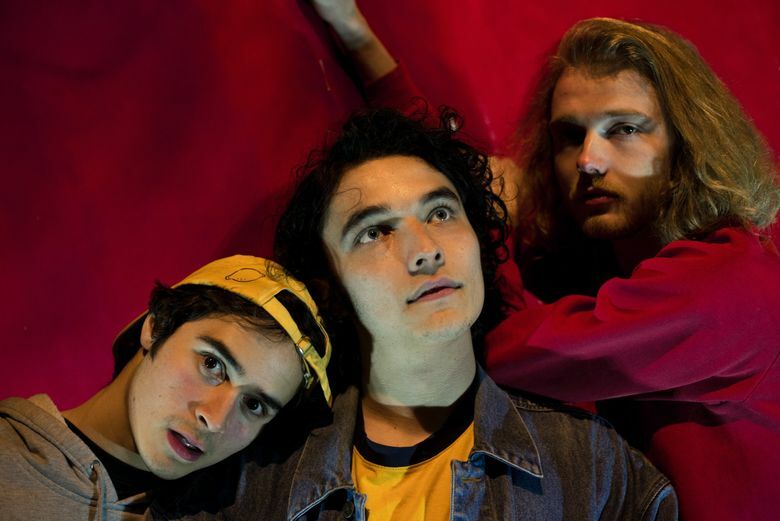 For anyone following Seattle’s rock scene, including many who packed Chop Suey for Naked Giants’ album release show last week, the energy has come to be expected from the gonzo garage rockers. The young power trio landed on the local radar as a Sound Off! finalist in 2015 and has since earned a rep for its rambunctious live shows. And after joining Car Seat Headrest‘s touring band and a reportedly strong showing at South by Southwest last month, it seems others are catching on. Besides the SXSW-branded tumblers they received for playing the notoriously unpaid festival, Naked Giants walked away from the annual industry shindig with a decent amount of buzz, including a shout-out from Rolling Stone as one of the fest’s top 30 acts (last year more than 2,000 artists played). So far those Austin journeys (three now) have been worth the gas money for the young trio. They signed a record deal after being spotted last year by New West Records, a plugged-in indie founded by Cameron Strang, who later did a stint as CEO of Warner Bros. Records. Since the ink dried, the juuuuuust-old-enough-to-drink lads ditched their day jobs (though LaVallee still does some drum teaching) and dropped their debut album, “SLUFF,” via the traditionally alt-country label last week. Now, they’re hitting the road again, doing double duty with Car Seat Headrest, which includes a sold-out April 12 stop at Tacoma’s Real Art. “We’re a rock band that’s high-amp and kinda weird and not exactly what you see when you go to an indie-rock show,” LaVallee proclaims. Heavyweight Northwest producer Steve Fisk helped the band harness the high-octane spirit of Naked Giants’ live shows with what Mullen describes as a “super lax” approach at times, encouraging them to not always do copious takes of each part. Admittedly, they might be more meticulous next time, but the result is a warmly raw record packed with surfy licks and power-pop rompers, while avoiding the garage-rock pitfalls of lo-fi limitations or being inauthentically overproduced. And the songs’ indirect profundity can also be kinda hilarious. During the video shoot for “Everybody Thinks They Know (But No One Really Knows)” — a hooky garage-pop number turned ironic social commentary — they invited a random passer-by to join their spoof protest led by an online rabble rouser. At the end, the person approached LaVallee for insight into the song’s underlying wisdom. “They were like, ‘Is that a stance on the perception of truth in our society?’ They were a philosophy major at UW or something,” he recalls. Since then, his father’s been recovering well (he planned to attend his son’s big release show last week). And judging by the steam behind Naked Giants, music worked out even better than getting baked and hiking.